This day-long leadership training will equip participants with processes for implementing successful community projects. Participants will hear from two panels of community members who led efforts in Scottsbluff. 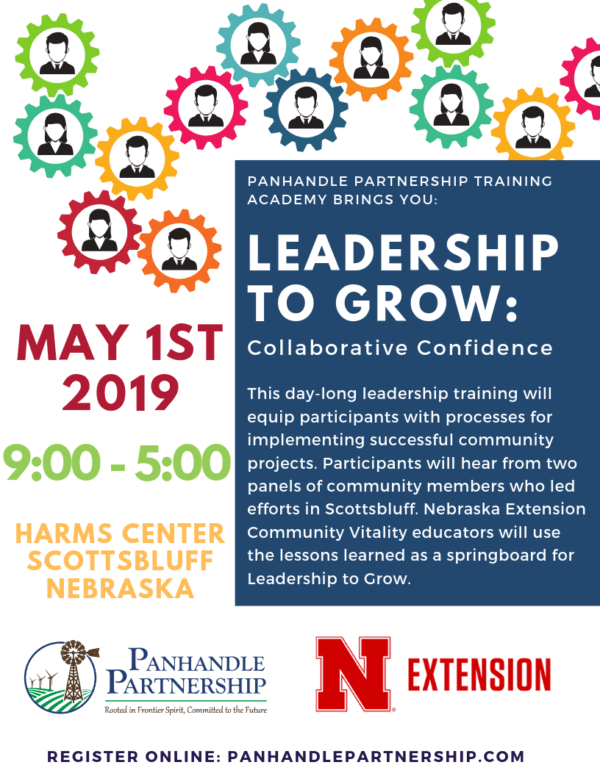 Nebraska Extension Community Vitality educators will use the lessons learned as a springboard for Leadership to Grow. They will teach how to lead collaboratively to bring together diverse stakeholders together to suggest ideas and make plans in response to community needs. Leading collaboratively creates inclusivity amongst community members which in turn keeps people inspired, engaged and moving forward. The educators will also focus on the nuts and bolts of leading group operations and providing appropriate structure for productivity and decision-making. Groups with a track record of completing successful community projects use traditional tools and processes through all phases of planning and implementation. Engage in building community vitality and prosperity in the Panhandle. Register today for Leadership to Grow. You’ll learn meaningful processes for leading collaboratively and effectively.